You must read the instruction leaflet carefully before use How does Fungal Nail Treatment work? Phase 1: Treatment Phase (4 weeks) To treat the nail fungus Week 1 - File the nail surface once a week Dispose of the file after use Apply the advanced liquid to the infected nail daily Repeat for weeks 2, 3 & 4 Phase 2: Protection Phase (9 months) To prevent spreading & protect from recurrence Apply the advanced liquid to the infected nail once a week for 9 months or until the discolouration has grown out. What are the visible results? At the end of the Treatment Phase the level of discolouration on the nail is reduced. 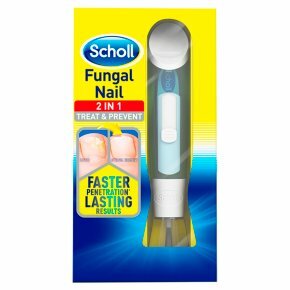 After 9-12 months which is the average length of time a toenail takes to grow-out completely, the discolouration will have disappeared and nails will have recovered with no signs of fungal infection. Advice: Avoid contact with eyes and skin. If irritation occurs, discontinue use. Always replace cap after use. <br>To avoid the spread of infection, never reuse files.<br>For external use only: Do not use on broken skin or any other foot conditions. Keep out of reach of children.<br><br>Scholl and diabetes<br>Please SEEK ADVICE before use if you have diabetes as your foot condition may require treatment by a healthcare professional.